Sedaris leads me to believe that the same is true of those who love prose. I always like to see what other writers have to give in the way of advice. How did you get started Mr. Sedaris? And…Where did you find the time and discipline to follow through? The answers to these questions revealed themselves to me in the form of past interviews with David Sedaris. I recently turned 21 so this advice resonates with me on a personal level. His next bit of advice is equally useful but difficult to adjust to. Often strangers will give me their writing. This guy in Manchester, England, he worked in a bookstore where I was giving a reading, and I talked to him off and on all night. It took him a long time to admit that he wrote, and then I pestered him some more and I finally got him to agree to send me something. It was fantastic; it was original and surprising, it was just as if he had reinvented language. I kind of knew it was going to be. Compared to people who come up and say, “‘Here’s this thing I wrote. I took a creative writing class; how do I get this published?” and I already know it’s going to be no good. It was shocking to me when I moved to New York, went to a play and half the audience had invitations for their own plays—you can see people just promoting themselves. I was just so appalled and sickened by that self-promoting behavior. You’re going to get a lot further when it’s someone else’s idea that you’re good. Let yourself be someone else’s discovery. A lot of this kind of self promotion happens on Twitter. I want to establish a web presence as much as anyone else, but there comes a point when you stop reaching out to people sincerely and become a big, hairy, social media robot. I’m a 49ers fan and was flattered when a stranger tweeted me something like: “Lets go! I bleed red and gold! Check out my song” I retweeted his comment initially, then looked at his profile picture in which he was wearing a Dallas Cowboys hat. It’s an odd position to be in I think. You want to get noticed but at the same time you don’t want to come off as desperate. 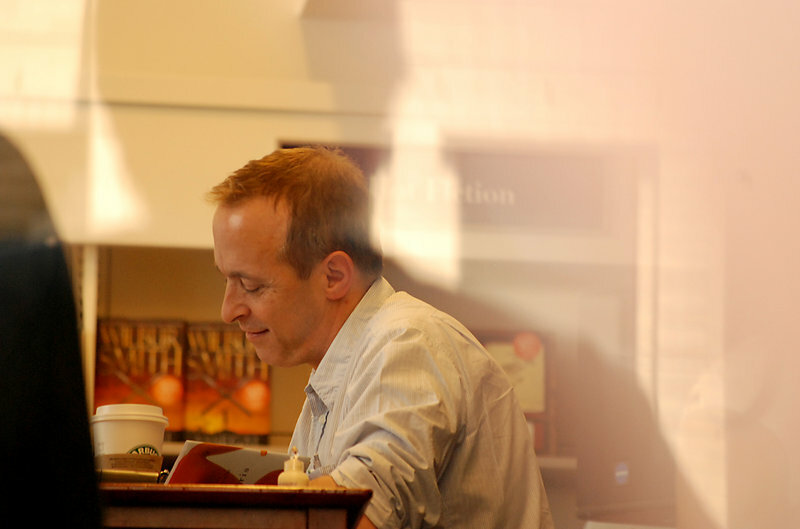 By Sedaris logic, it is better to be the bookstore clerk, not the audience member. I can’t imagine anyone offering an aspiring writer a book deal–no questions asked, besides Chad Ochocinco. It is also interesting that Sedaris says he knows someone’s writing won’t be good just by the way they are marketing themselves. How do we get discovered I wonder? #Itsnotwhoyouknow #butwhoknowsyou? For your listening pleasure, his first hit!